Hello, Bloggers! Hopefully, you have just arrived from Alanna's blog. If not, don't worry. You'll get up to speed in just a sec! Lollipop Crafts Challenge Blog is celebrating its two-year anniversary with a blog hop! The hop starts today, August 1st, and runs through August 4th. That gives you plenty of time to participate for a chance to win a prize. Please visit each of the DT members' blogs where we have hidden a few prizes. We also have two chances for you to win on the Lollipop Crafts Challenge Blog -- one chance just for commenting and a second chance by participating in our challenge. Speaking of challenges, the theme and challenge for this hop is "Celebrations", so be sure to incorporate that theme into your project! For this hop, each of the DT members is showcasing a digi from a different sponsor. We won't tell you who the sponsor is, though. That's part of the fun! We also have Barbara joining us for this hop. She was on our very first design team, and we are so excited to have her join us. Now, on to my project! 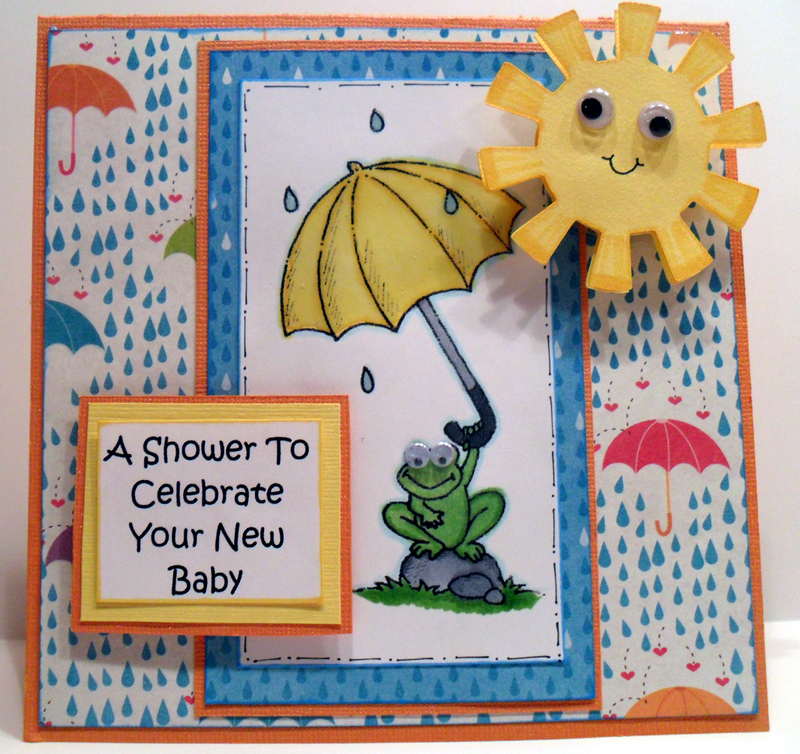 I chose to work with this adorable frog digi called "Don't Rain On My Parade". I knew I had the perfect paper to pair it with. The raindrops and umbrellas worked so well with this image. I colored the digi with Copics and, of course, I just had to add Glossy Accents to the umbrella and the raindrops. I couldn't forget to add Googly eyes to both the frog and the sun -- which was an svg file from svgcuts.com. Now, to add some whimsy to this card, I decided to use an Action Wobble on the sun. I actually cut the sun out twice and then adhered the two layers together with pop dots. I felt that the sun needed something, so I first added some color to the rays with a Copic marker. I added the Googly eyes and drew in the smile. The bottom left picture shows my daughter pulling on the sun gently. The bottom right picture shows what happens after she let go of the sun. IT WOBBLES! How fun and cool is that, huh? Your card is super cute. So bright and cheery. Cute card, love that action wobbler on the sun.... Haven't tried it out yet! 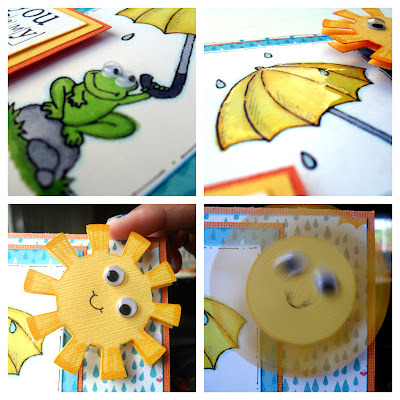 Love your fabby creation.. great details, love the action wobble on Mr. Sun. Also love the froggy. Ahhh!!! this is sooo cute and fun! Love those wobble things! And those eyes are awesome! I need to look for my stash of them. hehehe. Fun and fabulous Dena! My guess is Robyn´s Fetish Digital Stamps. Love the whimsy of your card---1st introduction to the wobble. How cute! I love the wobble sun! :) Robyn's Fetish Digital Stamps. Great card..love your coloring, and love your choice of papers to bring it all together!! robyn's fetish digital stamps. so cute. Cute frog and love all the details. Certainly from Robyn's Fetish. How adorable! Is this from Robyn's Fetish? Lemonade Blog Hop: July 15th !